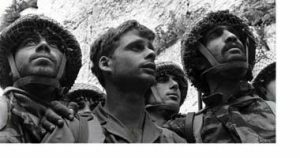 Today its 50 years since the six day war and I have a client who was a young paratrooper in that war. He has told me little about the actual war, but what he did talk about was the period before the war, the waiting period, when they knew, that the arab armies that were poised to attack (and could wait as long as they wanted) were talking about a war of annihilation, for the destruction of Israel. Little is mentioned about this period in the western press, how the Israeli economy was put to halt as much of the population was in the army just waiting, how farms lost their workers (he was from a moshav and worked in his family’s fields) as did factories….It wasn’t just the tension on the national front, it was family economies that were being destroyed as well. I don’t know if the world could have done anything to stop the situation, but for sure they didn’t help much. Israel’s destruction would have simply been a foot note in history had those young soldiers failed.